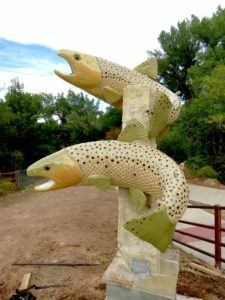 Moab ArTTrails is pleased to announce the installation of 16 outdoor sculptures along an art trail in central Moab. On Saturday October 13th, in conjunction with the Red Rock Arts Festival and Street Fair, 12 artists selected from a national call installed their work in the heart of Moab for a year. 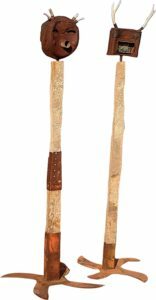 All works are up for consideration for the public's permanent collection. The second year of this program is produced with the kind support of the Moab Arts Council, the Moab Arts & Recreation Center, Grand County, the City of Moab, and the grace of a whole host of totally wonderful artists, contributors, arts lovers, civil servants, builders and friends. Enjoy the exhibition! The inaugural 2017-18 exhibition yielded three new additions to the permanent public collection. "The Hatch", by Reno, Nv artist Peter Hazel, was purchased by Moab ArTTrails and placed at the 300 S entrance to Millcreek Parkway. 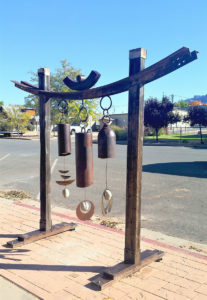 "Bell Tower", by Marysvale, UT artists Christopher Coleman, was purchased by Moab City and remains in front of the Moab Arts & Recreation Center. And local artist Dre Carmen generously donated his work, "The Keepers" which stand at the 100 S entrance to the Millcreek Parkway. Moab ArTTrails is a non-profit organization that celebrates the vibrant culture and resilient beauty of place through the exhibition and procurement of artworks for the public’s permanent collection. Moab ArTTrails launched its program in 2015 with a permanent gift of art to Grand County. Forces At Play. 4 large scale stone and steel sculptures stand as elegant invitation to Place, installed and enthusiastically received by the community at one of the oldest shared pathways in the Far West, the Moab Crossing at the Colorado Riverway Bike and Pedestrian Bridge. Moab ArTTrails conserves the cultural and economic health of the community through the exhibition and acquisition of enduring public artworks which connect beauty, people and place on shared trails through time. Moab ArTTrails is made possible through the generous support of foundational and individual donors and sponsors who recognize the value of art as a vital factor of a vibrant community. You can help sustain and grow this program by donating or sponsoring and artist.